Africa. Widely distributed across central Africa south of the Sahara Desert and north of the equatorial rain forests. Found in areas from western Senegal to East Africa and as far south as Cameroon. Savanna and woodland habitats, usually in open areas without dense cover; prefer grassland-woodland margins. Able to tolerate arid conditions. Most habitats are marked by seasonal wet and dry periods. Body length is 19 to 28 inches not including the tail, which can be nearly as long as the body. Weight ranges from 15 to 28 pounds. Males are larger than females. Maximum of 21 to 24 years. Omnivorous. 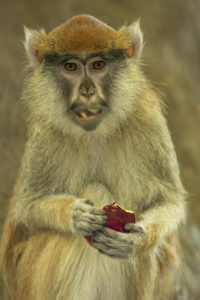 Patas monkeys are relatively adaptable in terms of diet. They feed mainly on grasses, fruits, beans, and seeds but may also eat roots, insects, and bird eggs. They will eat invasive species such as prickly pear and Lantana, as well as cotton and food crops. Patas monkeys are built like greyhounds with narrow bodies, prominent rib cages and long legs. They have shaggy, reddish-brown fur with white on the under side and on the legs and feet. They have grey chin whiskers and white moustaches. Nostrils are narrow, close together, and pointed downward (characteristic of Old World monkeys). Female patas monkeys usually give birth to 1 offspring each year. The gestation period is 7½ to 8 months, and most births occur in December or January. Mothers take care of their offspring until they become independent. Female offspring may continue to associate with their mothers in the same social group throughout their lives. At maturity male offspring leave their mothers and live independently or join all-male groups. Females become sexually mature at 3 years and males at 4 years. Patas monkeys are physically adapted for life on the ground. With a body built like a greyhound, they are probably the fastest primates on earth. Their long forelimbs facilitate rapid quadrupedal movement at speeds of up to 35 miles per hour. These monkeys rely primarily on speed to avoid predators. They can also stand on two legs when alarmed and can walk on two legs if they are carrying items in both hands. Although patas monkeys spend most of their time on the ground, they can climb small trees when startled. 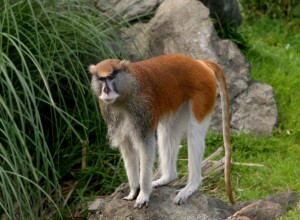 The long tail of the patas monkey is most likely used for balance. It can act as a brace when the monkey is descending from a tree, but it is not used for grasping the way the prehensile tail of many New World Monkeys is used. Patas monkeys live in social groups with 10 to 40 females and 1 adult male. The male acts as watchdog and quietly warns the group when a predator is near. While the females and young remain concealed in the grass, he creates a diversion by rushing in the opposite direction or by bouncing noisily in a tree. Social organization within patas monkey groups is not well known, but dominance hierarchies are not apparent. Home ranges are large, and females will defend the resources in their home territory from females in other groups. Because of their wide distribution, patas monkeys are less endangered than other African primates. They are listed by the IUCN as a species of Least Concern, although their populations are declining. This species is hunted as part of the bushmeat trade, which is defined as any hunting of wild animals for food, medicine, or traditional cultural uses. This practice has not yet substantially reduced the number of patas monkeys. However, as human populations continue to grow this threat can only increase in the future. Patas monkeys also face threats from habitat loss resulting from land-use practices such as overgrazing of cattle and clearance of savanna for crops. In some parts of their range, these monkeys are killed because they steal crops such as millet, bananas, peanuts, wheat, and dates. They also destroy cotton plants by eating the flowers. Patas monkeys are sold for medical research and as part of the pet trade, with over 1000 being collected from the wild each year. There are now numerous national parks and reserves in Africa where patas monkeys are found, and measures have been introduced in some countries to limit exportation of these animals.